The favourite chain weave of all ancient European civilizations was the so-called loop-in-loop pattern. It has been used in jewellery from Ancient Sumer through most of Ancient Europe and Middle East, including Ancient Egypt, Greece, Rome and Byzantium. It disappeared in Medieval times only to be revived in the 1800s with all other things "Etruscan" and ancient. Because of my anachronistic tendencies, I have always wanted to possess and wear necklaces of this type. 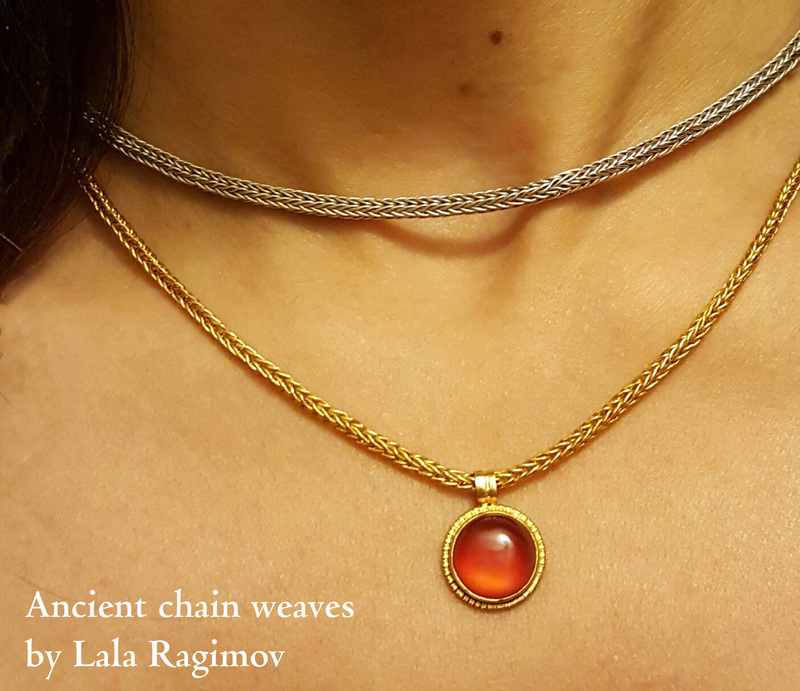 In 2014 I got a chance to learn how to make them, and so far I have made six of three different weaves and four different alloys of gold and silver. 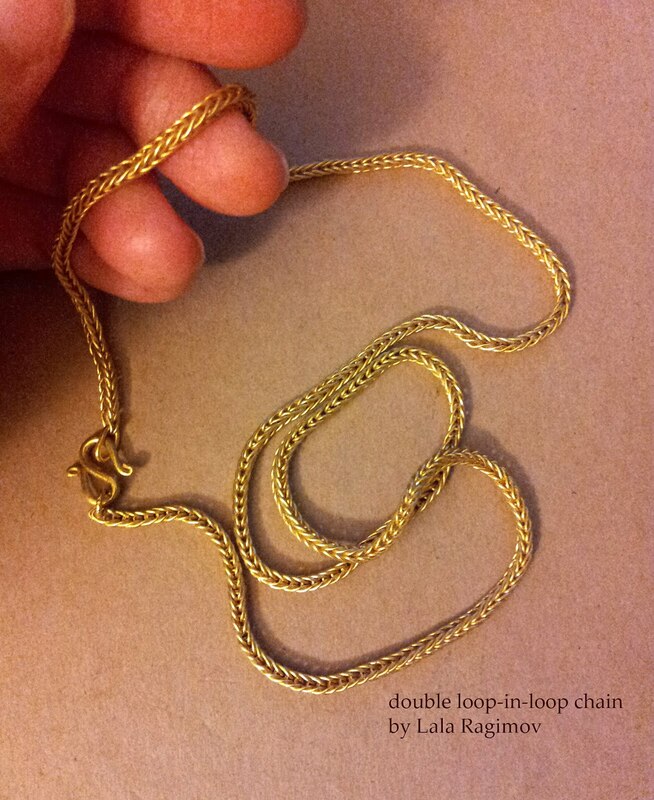 My technique is based partly on the one described in the well-illustrated and practical book “Classical Loop-in-Loop Chains” by J. Reist Stark and J. Reist Smith, partly on the experience and advice of jewellers I consulted, and on my own personal trials and errors. The wire was made by a professional jeweller (assisted and photographed by me as you can see below). The chains themselves were fused and woven by me. First the 24k gold grains are weighed in correct proportion to the grains of silver and copper. The mould is then prepared by rubbing it with machine oil and warming it up. Reist Stark and Reist Smith in their book suggest a recipe for 22k gold with a high proportion of silver for ease of fusing (the so-called eutectic gold: 91.6% Au, 6.3% Ag and 2.1% Cu). In my experience, the standard 22k gold alloy (91.6% gold with the remainder evenly split between silver and copper) was easier to fuse. 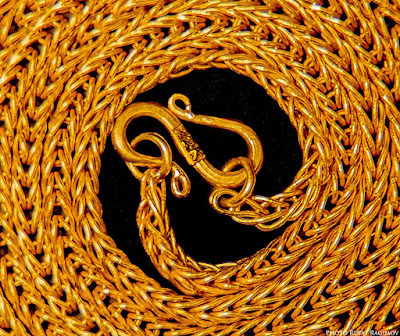 The authors also state that their 22k alloy is close to that used in Greek and Roman chains, but from what I read in other sources, the alloys used in antiquity were extremely varied, from under 18k to nearly 24k, and seem to have been around 23k most of the time. The conservation journals and books I read did not have specific results for chains, so I still don't know what the typical alloy for chain wire was in the Antiquity. The gold silver and copper shot is then melted in a crucible while being stirred with a graphite rod (graphite is used because it doesn't transmit heat). The liquid metal is then poured into the mould. The clamps are released, and the resulting 22k ingot is removed. This ingot was then rolled on a rolling mill to reduce its thickness to 1.5 mm at which point the draw plates could be used to reduce the diameter of the wire even further. The wire was annealed when it got too work-hardened by these manipulations. After the final annealing, the jeweller rolled the resulting wire into coils on a lathe (not shown), and from that point I took over. First I cut the springy gold wire coils into links. Then I butted the link ends together and made sure there is tension between them to keep the gap small. I laid out the links on a piece of charcoal, and fused them with a small and very convenient micro-torch (ES-1000) using a small and “bushy” reducing (low-oxygen) flame. The hardest part of the process is fusing the links: any blinking or breathing at the wrong time can make you miss the split second in which the link melts and turns into a cute but useless little torque with shiny beaded ends. 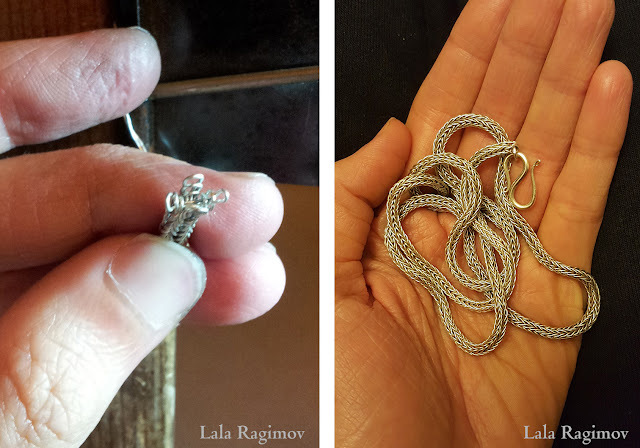 Part of the links always get spoiled this way, especially if they are silver, but the process itself is not difficult to understand. It took me only about thirty minutes to learn how to consistently produce viable fused links. After fusing, links need to be tested by pulling them into ovals with round-nosed pliers. As the links are stretched, the badly-fused ones break, ricochet on all available objects, and fly to the far corners of the room. Despite precautions, some of my chain-making time was spent on the floor sourcing scrap metal. 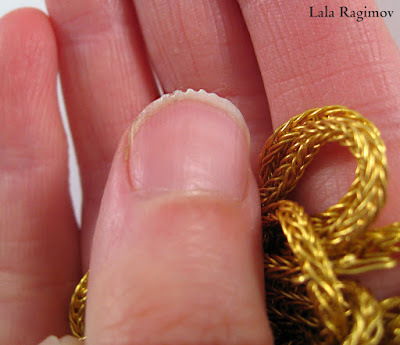 The links that passed the test are pinched in the middle and curved into a butterfly-like shape. After the butterflies are annealed, the weaving can begin. The only tool needed for weaving a standard chain is an awl to open spaces between the links and to pull on the open ends of each freshly inserted link to tighten the chain. The first chain I made (a commission for a client) was a thick “double loop-in-loop” (still oxidised and unpickled on my neck in the central picture, pickled and shiny to the right). For weave comparison, the silver chain section on the top right is the “single loop-in-loop” weave, the simplest of all, where each link is connected to only two other links instead of four. I later made another chain from 24k gold (seen in the picture second from the top), and it came out looking more irregular and loose because the links were softer and stretched more during the weaving process. I did enjoy the gleaming polished gold look as it came out untarnished from the flame. To conclude, the process of ancient chain-weaving demands a lot of concentration and patience, even if you start with ready-made wire. The beautiful results make up for the effort completely and are definitely worth it, especially for those who enjoy wearing and touching history like I do.